Bunaken is an 8.08 km² island in the Bay of Manado, situated in the north of the island of Sulawesi, Indonesia. Bunaken forms part of the administrative city of Manado , capital of North Sulawesi. The marine Park around Bunaken is part of the National Park that also includes the ocean around the island of Manado Tua – or Old Manado, Siladen and Mantehage. Within the Bunaken Marine Park, visitors can see various strange and colourful marine life along its sea bed. To reach this park, you can take a motorboat. The journey from Manado takes around 40 minutes. Entrance fee is 25,000 rupiahs per person per visit. The translucent waters of the Bunaken seas enable people to clearly view numerous sea biota. There are 13 species of coral reefs in this park, dominated by edge ridges and block ridges of rocks. The most attractive view is the steep vertical sloppy coral reef that plunges down as deep as 25-50 meters. Feast your eyes on 91 types of fish found in the Bunaken National Park, amongst which are the locally known gusimi horse fish (Hippocampus), the white oci (Seriola rivoliana), yellow-tailed lolosi (Lutjanus kasmira), goropa (Ephinephelus spilotoceps and Pseudanthias hypselosoma), ila gasi (Scolopsis bilineatus) and others. Divers may also meet mollusk like the giant kima (Tridacna gigas), goat head (Cassis cornuta), nautilus (Nautilus pompillius) and tunikates/ascidian. For those who enjoy scuba diving, this is a great place to be. With about 20 dive spots to choose from, divers will have the chance to swim below the sea, and frolic joyfully while admiring the sea creatures. Make sure to visit Bunaken during its best season between May to August. That way you can explore the Park to its fullest. Most diving takes place near Bunaken and Manado Tua, because of the many excellent sites. The following are representative of dive spots in the area. This long wall at Bunaken is divided into three sites: the Lekuan I, II and III. Together they are the park’s best. Steep walls are marked with deep crevices, sea fans and giant sponges. The shallows are filled with fishes. The wall, often protected from stronger currents, is frequented by bumphead parrotfish, turtles, and Napoleon wrasses. Mandolin has a knockout reef crest and a wall that attracts thousands of fishes like schooling fusiliers, surgeonfish, unicornfish, and bannerfish. They are used to divers and are easily approachable. There are strong currents and lots of fish on this long wall. The shallow reef isn’t as spectacular as some but there are turtles, sharks, eagle rays, and other big fish in the blue. Overhangs and small caves mark the wall. Tanjung Kopi is a nice wall with a small school of barracuda and lots of sweetlips. Visibility in the shallows is not terrific but the numbers of fishes make up for it. Nudibranches and fire gobies are easy to spot here. Siladen has a beautiful wall of soft corals that bloom when the current is running. The shallows are nice with lots of fishes and schooling snappers. 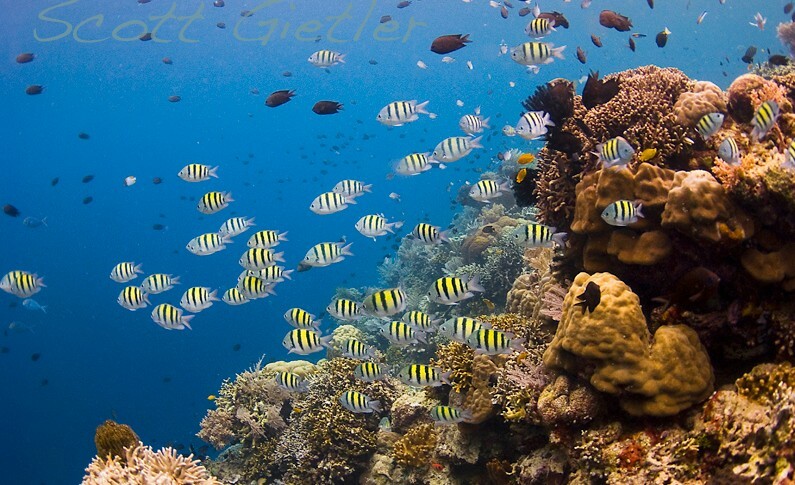 Muka Gereja is a pretty site with thousands of fishes in the shallows and deeper canyons that lead to the wall. Barracuda Point, on northwest Montehage, is one of the furthest sites. A school of giant barracuda are regulars along with jacks and tuna. This 60m (200ft) long German merchant ship sank near Molas Beach in 1942. It sits upright with the bow at 23m (78ft). The ship is split near amidships back to the stern, exposing the wheelhouse and cargo holds. Dives finish up on a nearby shallow reef. Expect 10-15m (30-50ft) visibility. Other than diving-enthusiasts, ornithologists and amateur bird-watchers might find visiting Tangkoko Dua Sudara Nature Reserve entertaining.